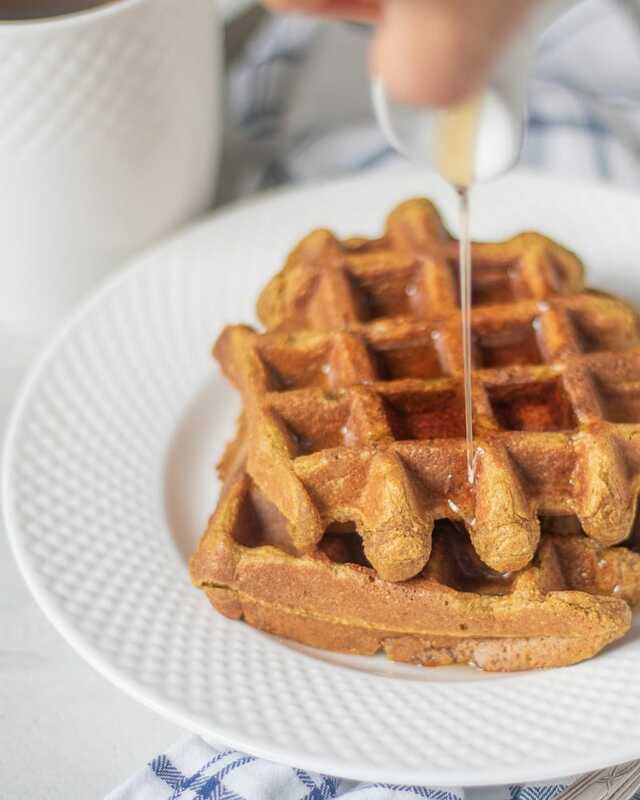 Gluten Free Sweet Potato Waffles: Rich, warming spices, and sweet potato are blended into an easy gluten-free blender waffle batter that is transformed into the perfect fall breakfast. I have shared many pancake recipes on the blog. Peanut Butter Cup Pancakes, High Protein Blender Oatmeal Pancakes, Strawberry Cheesecake Pancakes, PB&J Pancakes and even Sweet Potato Pancakes. Yet, I have only shared one basic whole wheat waffle recipe. So it is high time I give some waffles some love–especially since I love waffles more than pancakes myself. It is those crispy edges and pockets for syrup that get me! So today I am sharing with you one of my fall favorites, Sweet Potato Waffles. The best part about these sweet potato waffles is the rich warming fall flavor that comes through in every bite. I love to make them the day after Thanksgiving and sub out my leftover Sweet Potato Casserole for the sweet potato puree. But you could use canned pumpkin or even pumpkin pie –why not?! To make sweet potato puree–roast sweet potatoes at 400 degrees for 30 minutes, or until fork tender. Scoop out inside of sweet potato and mash or put in blender and puree until smooth. Add remainder of ingredients into the blender that you blended the sweet potato puree in. Brush with melted butter or coconut oil. Pour 1/3 cup waffle batter unto waffle iron an cook until crisp. Finish with bit of syrup and maybe a few toasted walnuts, and hello, breakfast! 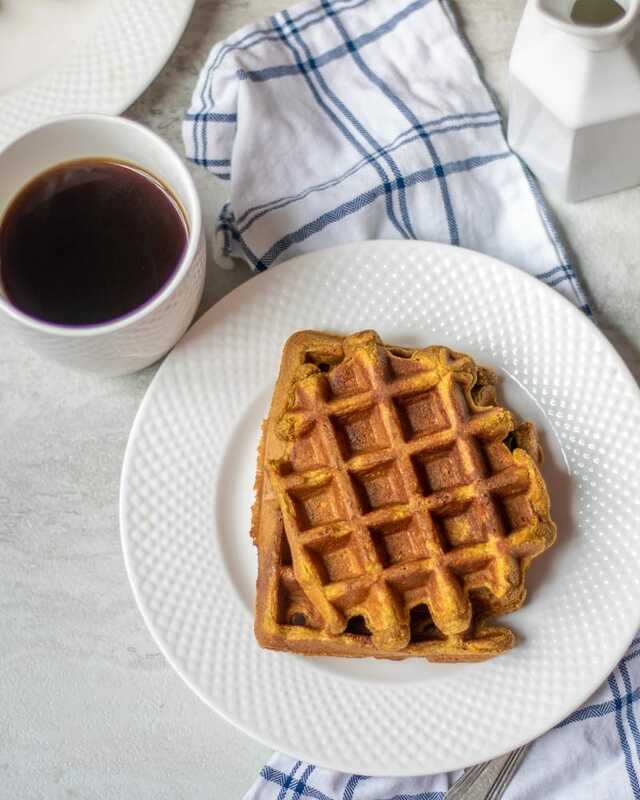 If you are not looking for a gluten-free recipe, you can easily make these waffles with flour for traditional Sweet Potato Waffles. Replace the oats with 2 cups all purpose or whole wheat flour. Mix the flour with baking powder, baking soda, salt, and spices. Mix together the wet ingredients and pour into the dry ingredients. Pour by 1/4 cup onto prepared waffle iron. You can use gluten-free oats, old fashioned regular oats, or quick cooking oats for these sweet potato waffles. Do NOT use steel-cut oats. Any variety milk works well in this easy waffle recipe. Use coconut milk or almond milk to keep these dairy-free sweet potato waffles. A delicious recipe for gluten free sweet potato waffles. 2 cups Sweet potato puree or leftover sweet potato casserole or pumpkin puree. Ladle 1/3 cup of mixture unto each waffle iron mold and cook until golden on both sides. Serve with toasted walnuts and maple syrup if desired. If you don't want these waffles to be gluten-free, use 2 cups all purpose flour in place of oats--but I find everyone loves these waffles--even if they aren't gluten-free. Oh Yum! I love sweet potato everything, these look fantastic! These MUST go on your list Shashi! You are very lucky indeed! Great idea to sub in the sweet potato casserole from Thanksgiving, Kristen. What a delicious fall breakfast. We love waffles too. That is until our fancy waffle maker died last year. I need to pick up a cheap one that actually works! Yes–cheap waffle makers seem to do the job quite nicely! These look so delicious! I have to try these soon! THank you Taylor–they are very tasty! Where is the recipe please? With measurements? It is not here or on the linked Monday page. Thanks! 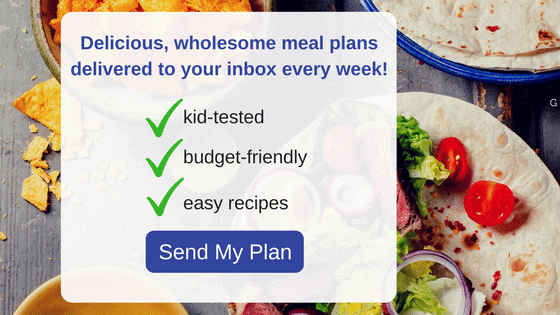 Oh my goodness Kathleen–I had updated the recipe Sunday night and looks like I accidently deleted the recipe–YIKES!!! It is all fixed now. They are absolutely perfect, especially in the fall months. 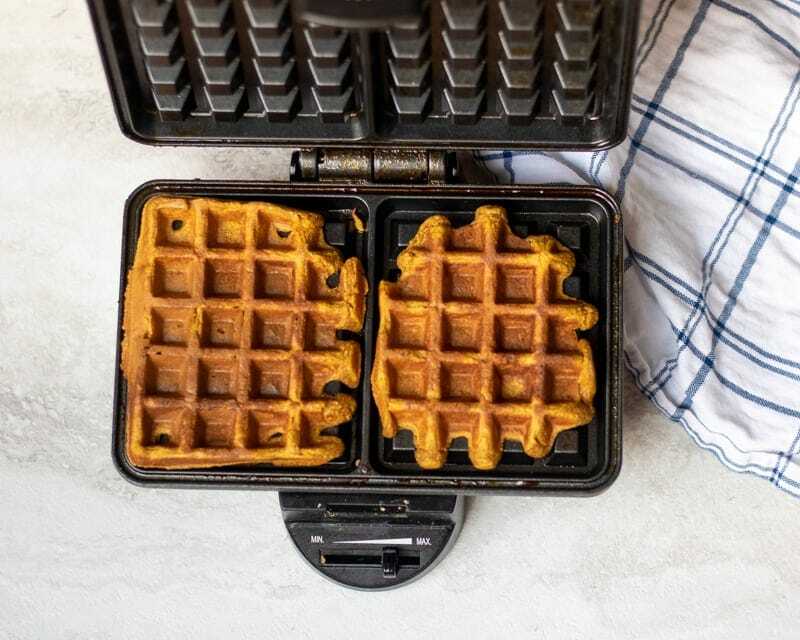 I’ve only made regular waffles so far and have loved them, but I LOVE this idea of making a healthy waffle stuffed full of sweet potato. Perfect! Am definitely going to try this. Thank you! YAY!!! You will love these Helen! Enjoy! I am so glad you enjoyed this recipe Betty! I love the idea of eggnog–what a perfect holiday treat. Good recipe but I’m not sure why the batter calls for baking soda and powder but not salt. We made these, subbing in almond flour, and they did come out light and fluffy, but lacked a dimension of flavor without added salt. Would also consider doubling the vanilla (which is what I usually do for cookie recipes) and other spices next time. Maybe I’m doing something wrong or my waffle machine is dying, but I’m finding that the insides are still fairly wet. Is this how they’re supposed to be? Hi there! It may be these waffles need a bit longer in your waffle iron. If wet in the middle, stick back on waffle iron and heat again. That should work, even if your waffle iron is losing some power. These are delicious. We used 1 cup organic spelt flour and 1 cup oat bran in place of 2 cups of oats and it turned out great. We also added diced kale and subbed flax meal and water for the eggs. It was fantastic. We really enjoyed these waffles. Thanks so much for sharing the recipe! Oh I love that you added Kale, I never would have thought to do that! Thank you so much for posting this recipe! I have made it several times for my family, half of whom cannot eat gluten. We don’t miss buttermilk waffles at all! I make these all year long. So you are very much appreciated! Your waffle recipe is Genius and a must try!!! I throw some toasted pecans on top for a little added crunch. I am SO happy to hear this Janet! It makes my heart so happy to know that your family can safely enjoy waffles!